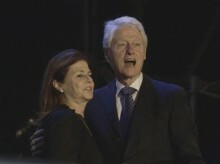 TEL AVIV, Israel (AP) — Tens of thousands of Israelis, along with former U.S. President Bill Clinton, marked the 20th anniversary of the assassination of Prime Minister Yitzhak Rabin on Saturday night, gathering in the Tel Aviv square where he was gunned down by a Jewish extremist and remembering his calls for peace. The event, attended by an estimated 100,000 people, was a rare show of strength by Israel’s dovish opposition, as speakers and demonstrators took aim at the hardline policies of Prime Minister Benjamin Netanyahu. Participants held banners reading “Enough scaring, yes to hope” and “Peace Now.” Clinton encouraged them to carry on Rabin’s legacy. The annual rally has become a pilgrimage for ordinary Israelis to pay tribute to the slain leader. With the passing years, though, the memory of the shooting that devastated Israel has faded, as have the prospects for peace. Rabin was shot dead after a peace rally on Nov. 4, 1995, by Yigal Amir, an ultra-nationalist Jewish extremist who opposed Rabin’s policy of trading land to the Palestinians for peace. Repeated attempts to make peace since have evaporated, leaving bouts of violence in their wake. Now, in the midst of yet another bloody round of unrest, many in Israel wonder whether peace will ever be possible. With Clinton acting as broker, Rabin’s government negotiated the first interim peace accord with the Palestinians in 1993, winning the prime minister — along with his foreign minister, Shimon Peres, and Palestinian leader Yasser Arafat — a Nobel Peace Prize for his efforts. In the square that now bears Rabin’s name, participants waved Israeli flags and carried signs of peace. Musicians perfumed songs of peace. In an effort to give the event a non-partisan appeal, no sitting politicians were invited to speak. However, many members of Rabin’s Labor Party were in attendance. Israel officially marked the anniversary last Monday, according to the Hebrew calendar. The entire week has been marked by events noting the two decades since the assassination. In the months before the killing, political hardliners branded Rabin a traitor and some extremists called for his death. Critics charged that the climate of incitement inspired Amir to shoot Rabin. In one famous incident, Benjamin Netanyahu, then the opposition leader, addressed a protest in downtown Jerusalem where demonstrators held posters portraying Rabin in an Arab headscarf or Nazi uniform. Saturday’s rally showed clips of that protest as well as other images that vilified Rabin. Netanyahu, who vehemently opposed Rabin’s planned concessions, only begrudgingly accepted the concept of a Palestinian state after taking office for a second term in 2009. But he has since distanced himself from those comments, and during his re-election campaign earlier this year, he said he would not allow a Palestinian state on his watch. President Barack Obama, who has often feuded with Netanyahu, lauded Rabin’s message in a videotaped address. Many Israelis say that beyond the soul-searching and tributes marking each anniversary of Rabin’s killing, key lessons have not been learned. Citing religious inspiration, extremists still threaten politicians, incite violence and carry out vigilante attacks against Arabs and dovish Jews. A recent target has been Israel’s ceremonial president, Reuven Rivlin, a political hawk who opposed Rabin but has recently spoke in favor of coexistence and warned against racism and extremism.